Janna is still looking for this dog. 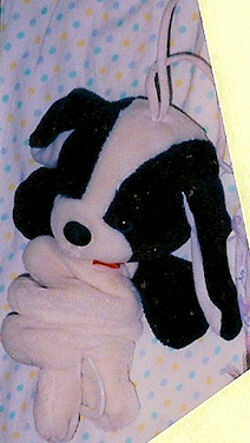 My daughter lost her favorite stuffed dog musical toy when we moved 3 years ago. She got it when she was 3 months old as a gift. She is now 9 years old and still cries whenever she sees a photo of “Snoop Dog”, which is what we called him. It was a musical pull down crib toy about 16″ in length when pulled down. I believe it played Twinkle Twinkle Little Star. It is a white dog with black ears and black by the eyes. It has a white muzzle and a black nose, and there’s a red bow around the neck. We would really appreciate your help. She is really sad. Kathy- tears of joy are streaming right now! I am thrilled and can’t wait to see her face when it arrives. It’s been a long wait and I have searched everywhere. I really can’t believe you found him. Our daughter will soon be 13, but to have him in her life once again will be worth it. Thank you Kathy and thank you Plush Memories!